Seen here, from left, are: Linda Rademan, Gabi Pabst, Alex Rautenbach, Sabine Pickworth, and Kanto Raomiala. 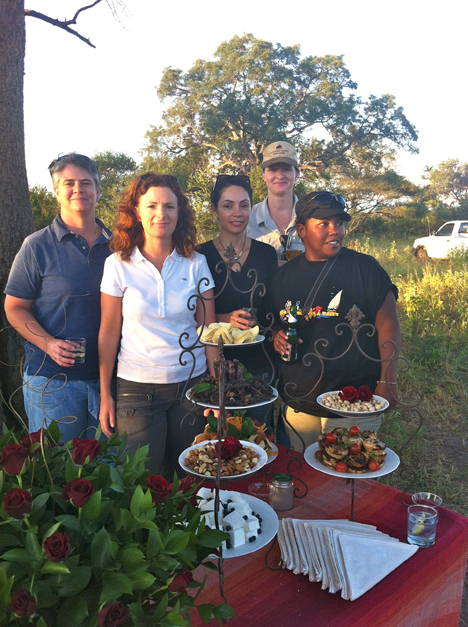 We recently had the pleasure of hosting an agents’ educational at Camp Jabulani. We invited some of our Capetonian partners to join us in the bush, and lured them from The Mountain with a promise of some extraordinary elephant encounters. We didn’t have to work too hard to lure our one Johannesburg-based consultant though…. Our party included Linda Rademan (Springbok Atlas), Gabi Pabst (That’s Africa), Alex Rautenbach (Wilderness Safaris), Sabine Pickworth (Welcome Tours), and Kanto Raomiala (XO Africa). And let’s not forget Anke Paterson and Adine Roode, both wearing their Camp Jabulani hats. Calvin was the lucky ranger assigned take care of the party. A wonderful time was had by all. We learned that Linda is scared to death of spiders. True as God made little green apples, what did we see in abundance? Our 8-legged friends. We also got to see a large male lion, a huge herd of buffaloes, and some general planes game too. Our chefs outdid themselves once again! You simply have to see some of the magic they prepared (link to our Facebook album is below). For those in the party, this recipe may well appeal to you….. (Hint: It’s white, soft, deeeelishis, starts with an M and ends in a W. Failing that subtle nudge, you can see it complementing this gorgeous sundowner set up above). A visit was arranged to the HESC where the group got to enjoy a sighting of 2 cheetahs feeding and a few rhinos before they even arrived. At the Centre they learned more about the Student Programme that appeals specifically to gap year students, wildlife enthusiasts and veterinary students. A real highlight, as usual, was the elephant swim. You have not lived until you have watched the Camp Jabulani herd around (and within) the waterhole. The outdoor spa treatment was balm to the soul as nature’s music worked its magic in tandem with the therapist’s experienced touch. After a sundowner of mandatory G&Ts for everyone (a must-do on safari to repel the mosquitoes of course), a night safari, and tucking the ellies into their stables, a fairytale dinner was set up as a surprise in the riverbed. To our participating agents, thank you for taking the time to come and visit! We loved every moment shared with you, and hope that you have been sold on the elephant experience that has found its way into the hearts of so many visitors from around the world. Click here to view the album of images on our Facebook page.